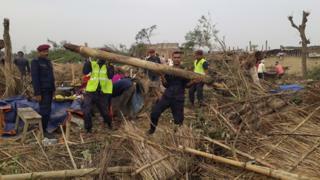 At least 30 people have been killed and hundreds more injured as a violent thunderstorm swept southern Nepal. Kusum Kalu, 70, told the BBC she had escaped death "by a fraction of a second" when the storm struck. "I was about to leave the house and just as I opened the door the roof of the house fell down," she told BBC Nepali in Bara district. "I don't think I would have survived had I already gone to bed or been a fraction of a second late to open the door." Draupadi Devi, in Balbariyam, Bara, told the BBC that every house in her village had been damaged. "We were five people at home at that time. A wall crumbled and buried us. We somehow managed to get out of the rubble," she said. "I've never seen anything like this. The winds took away everything, my home and my family," said Ram Babu Patel, whose wife died in the storm. "I was at home getting ready for dinner when the storm hit. It was unbelievable. We have nothing left," he told AFP news agency. "The storm destroyed everything in its path. Houses have no roofs and trees are all down," volunteer Prakash Tharu said.